Why Isn't My Car Key Remote Working? Car key remote fobs are a nice convenience to have, but they all stop working eventually. Even if it's just a dead battery, you can pretty much guarantee that your car doors will fail to unlock with the remote at one time or another. While here are a few different reasons that a keyless entry remote might stop working, most of them are pretty easy to check yourself. The most common problem with these car key fobs is that the batteries just go dead over time, in which case replacing the battery should fix the problem. Verify that the remote is actually bad by using a backup remote. Check and replace the key fob battery as needed. Take the key fob apart and check for broken contacts or misaligned buttons. Reprogram your remote yourself or have a professional do it. Replace your remote if necessary. Is Your Car Key Remote Actually Bad? This is extremely basic stuff, and it won’t apply to a lot of people, but the first step in figuring out what is wrong with a car key remote is to verify that the problem is actually the remote. So if you have a second remote, and you haven’t already done so, you’ll want to check whether or not it works. If the backup remote is able to lock and unlock your doors, then you’ll know for sure that there’s actually some kind of problem with your main remote. If your backup remote doesn’t work either, it’s always possible that it is also bad. However, there could also be a mechanical or electrical problem with the door locks. At this point, you'll want to check and make sure that your physical key, or emergency valet key, is able to work the locks. What about Cars with No Physical Keys? Some cars have push-button ignitions that only operate when the key fob is close by. These vehicles still usually have a physical key for locking and unlocking the doors, but it may be hidden. The key fob will often have a hidden key inside, so if you don't have a physical key for your vehicle, then check the fob for a release button or switch. The other issue you may run into is that some car doors don't have any visible place to insert a key. Most of these vehicles still have a keyhole, but it may be hidden behind a trim piece near the door handle. In that case, you will want to look for a trim piece with a small slot in it, which you will have to pry away to access the keyhole. Prying away a trim piece like this does carry some danger of damaging the paint on the car door or door handle, and you can also dent or bend the trim piece. So if you aren't comfortable, and there isn't an emergency that requires you to get inside your car immediately, you may want to consult a professional. If you are able to lock and unlock the doors with the physical key, then the locks are probably fine mechanically. However, there could still be an electrical problem. You can rule part of this out by locking and unlocking all of the doors via the physical master control inside the vehicle, which would indicate that the electronics are fine. 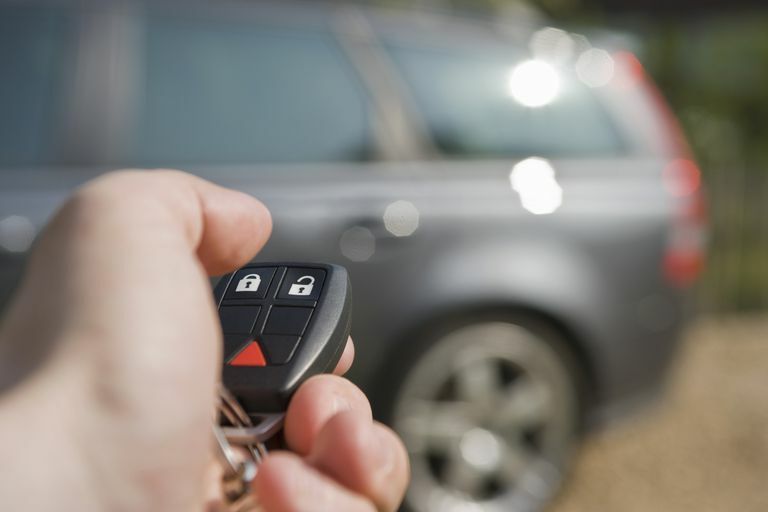 There is always a possibility that the receiver could be bad, or even disconnected, but it’s more likely that there’s just an issue with your keyless entry remote. Most car key remotes use category 4 button cell batteries that aren’t expensive. However, it’s still a good idea to verify the actual battery your remote uses and check to see whether or not it’s good. There are a few ways to determine the type of battery you need. It may say in your manual, or you can contact a local dealer. You can also just open up the remote and look at the battery, which will typically have a number printed or stamped into its surface. Car key remotes typically use CR2025 or CR2032 batteries, although CR1620, CR1632, and others are also used in some applications. Once you know what type of battery is in your remote, you can either check the voltage with a multimeter, or just swap out a known good battery since they aren’t that expensive. Most of these batteries should show about 3 to 3.6 volts. If your car key remote works after replacing the battery, then you’re done. If it doesn’t, then there could be another problem with the remote, like broken battery contacts or a problem with the buttons. It’s also possible that your vehicle may have forgotten your fob, in which case you will need to reprogram it. Key fobs are exposed to more physical abuse than most electronics, and they aren’t indestructible. The two most common points of failure are the battery terminal contacts and the buttons, although there are a lot of other ways they can break. The best way to check this out on your own is to just pull the remote apart again and do a thorough visual inspection. If the battery connector terminals are broken, you should be able to tell by looking at them, and they may also feel loose. If they are, then carefully soldering them back in place may return your broken key fob to useful service. If the battery terminals don’t look broken, you may find an issue where the buttons are soldered in place. They may be soldered back in place as well, if you find that they have come loose, unless a button is physically snapped off. The rubberized buttons used by most car key remotes can fail in a number of ways. If you notice that one or more of the buttons look like they aren’t popping back out correctly, or they seem to have come apart inside, that can prevent a car key remote from working properly. In order for a car key remote to work in a secure manner, it has to be effectively paired with the receiver unit in your car. This prevents anyone with the same make and model from walking up and using their fob to unlock your car. If your keyless entry remote and your car are no longer on speaking terms, you will have to reprogram your car’s keyless entry system to regain your car key remote functionality. This is often accomplished by getting in your vehicle, closing the door, and inserting the keys in the ignition. Rather than starting the vehicle, you will have to turn the key to the run position and back to the locked position several times in a row. If you turn the key to the start position, and the starter engages, you’ve turned it too far. In the case that your vehicle uses that method of reprogramming, you will typically hear a chime after you have cycled the key several times. You can then press one of the lock or unlock buttons on the remote, after which you should hear the chime a second time. Another method that some vehicles use is to get in the car and lock the door. You will then have to insert your key into the ignition and pull it back out six times within the span of 10 seconds. If your vehicle uses this method, and you succeed in doing it correctly, the exterior and interior lights will flash. After the lights flash, you will have to insert your key and turn it to the accessory position, then push one button on your remote. If everything worked correctly, your hazards will flash. There are other methods, and some require special equipment. In that case, you may have to contact your local dealer or an independent shop that has experience with your particular make and model of vehicle. If you have an aftermarket car security system that included remote-controlled door locks in addition to an alarm, then you'll need to check for any special reprogramming procedures associated with the system you purchased. The other option is to just buy a replacement remote, which you can obtain either new from your local dealer or used. If you buy a used one, you will have to reprogram your vehicle to recognize it before it will actually lock and unlock your doors. So if you discovered in an earlier step that your vehicle uses a remote that can’t be easily reprogrammed at home, you’ll want to keep that in mind. Used car key remotes are typically cheaper than new ones, but costs associated programming may outweigh the savings. Can Car Key Locators Really Help You Find Your Keys? Car Interior Lights Not Working? Don't Stay Stuck in the Dark!